Lauren Sears (left) and Molly Sanders-Cannon (right), research assistants in the ASI lab at Northeastern University. 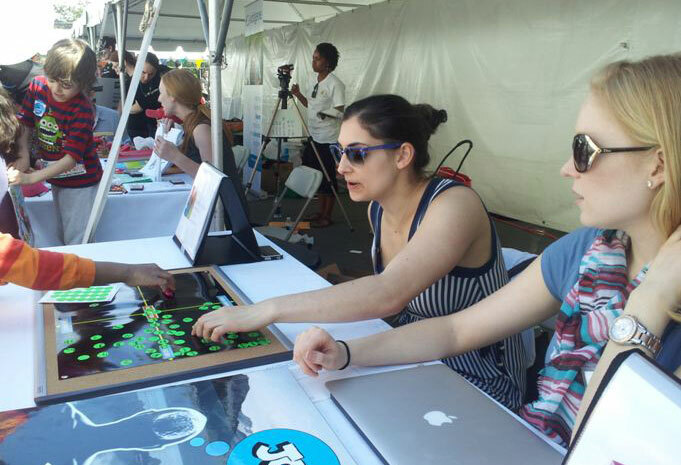 WASHINGTON — “Oh, I’m so glad that we found you!” one mother exclaimed as she and her young daughter approached the Affective Science Institute’s booth at last weekend’s U.S. Science and Engineering Festival on the National Mall. I started to tell her that one basic ingredient of emotion is called affect. While terms like this are generally reserved for psychology textbooks and scientific journals, as the educational coordinator of the Interdisciplinary Affective Science Laboratory located at Northeastern University, it is my mission to close that gap between academia and the public. The laboratory is co-directed by Lisa Feldman Barrett and Karen Quigley, both of whom are also on the Board of Directors at the Affective Science Institute at Northeastern University. As I spoke with this family, I felt warmed by the fact that our presence had piqued the curiosity of a parent and her child. Our booth was one of 3,000 interactive exhibits and 100 stage shows spanning all scientific disciplines at the three-day festival. While people easily and effortlessly experience emotions, scientists are still struggling to understand what they are and how they work. Still, there is a lot of knowledge that we can share with the public. Teaching the concepts, theories and methods of affective science through hands-on activities is a unique and valuable experience because it allows the public to understand these topics through their own everyday experiences and emotions. By representing the Affective Science Institute and the Interdisciplinary Affective Science Lab at this public event, we spoke with over 580 people who had the opportunity to ask questions about affect, emotion, psychology, careers, education and our scientific perspectives. This form of informal science education is crucial to bridging the gap between the academic community and the public. It is a means of sharing our research by allowing people to understand their own minds and experiences in a new way. In addition, I got to participate in a mother’s joy at communicating science and understanding to her young daughter. I am glad they found us too.